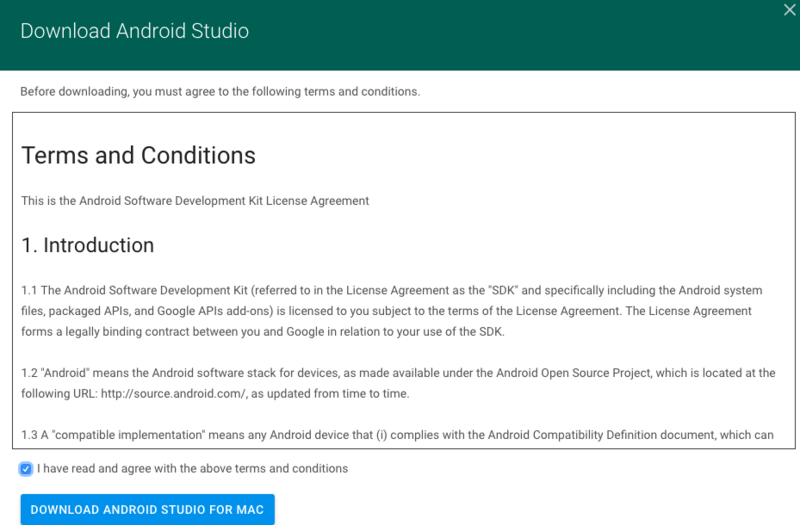 Accept terms and conditions and based on your machine, the correct download link will be displayed. 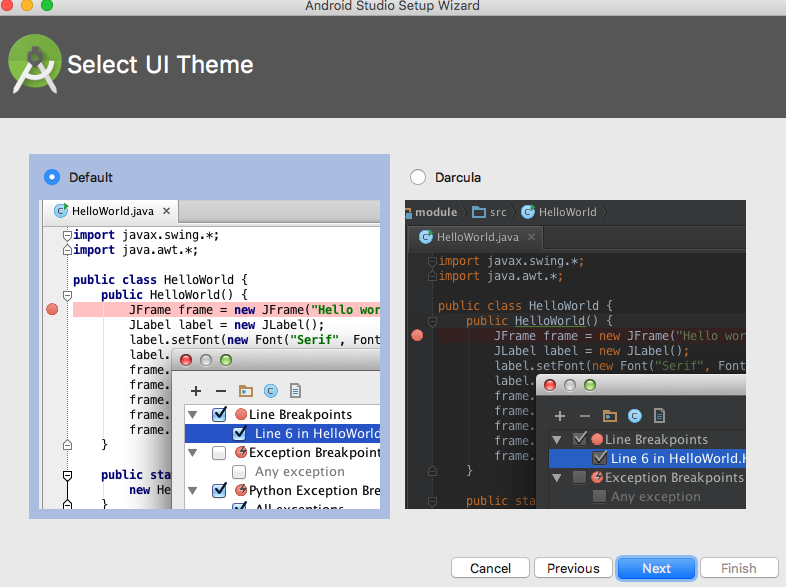 For MAC you will see ‘DOWNLOAD ANDROID STUDIO FOR MAC’ mentioned as shown in the above picture. 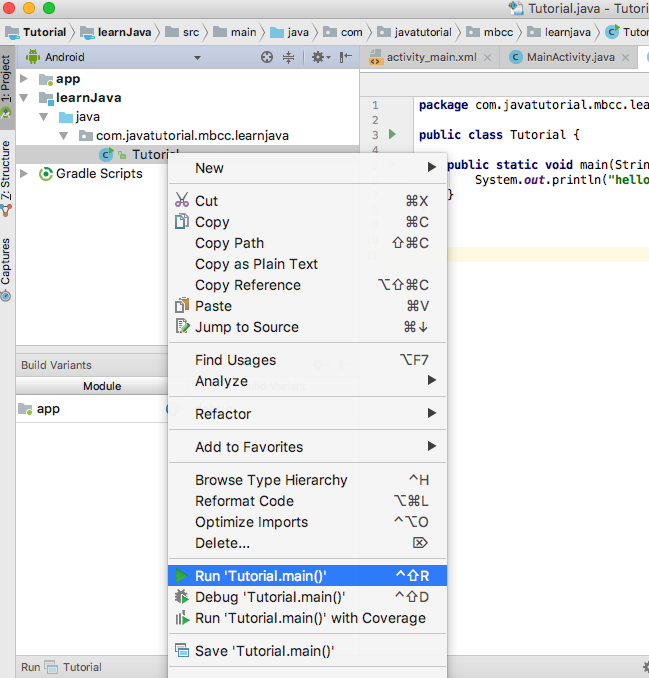 Watch the video to help you understand a few basic steps to be executed after download. The same page also has links to learning resources. "Learn with Udacity" is a resource you can consider in the future. 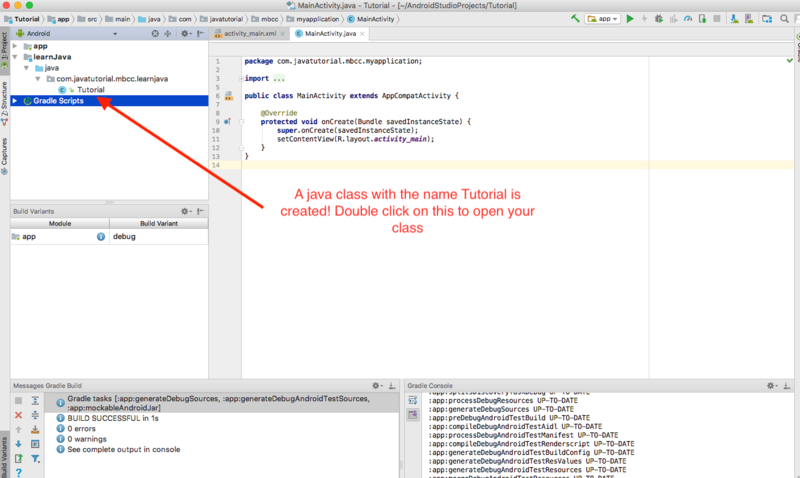 Since we are interested in learning Java first, we will leave the rest of the videos to much later in the book. 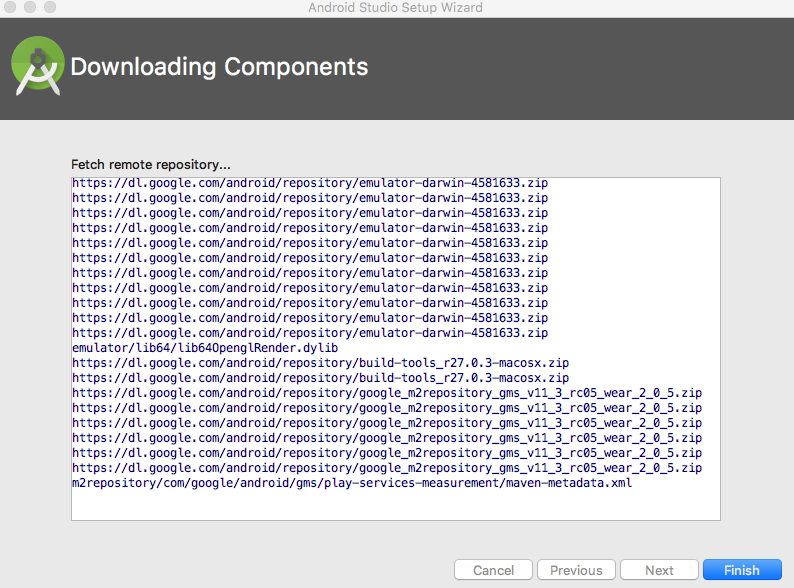 Once you hit finish in the last screen the app will start downloading the necessary files as shown in the screen below. 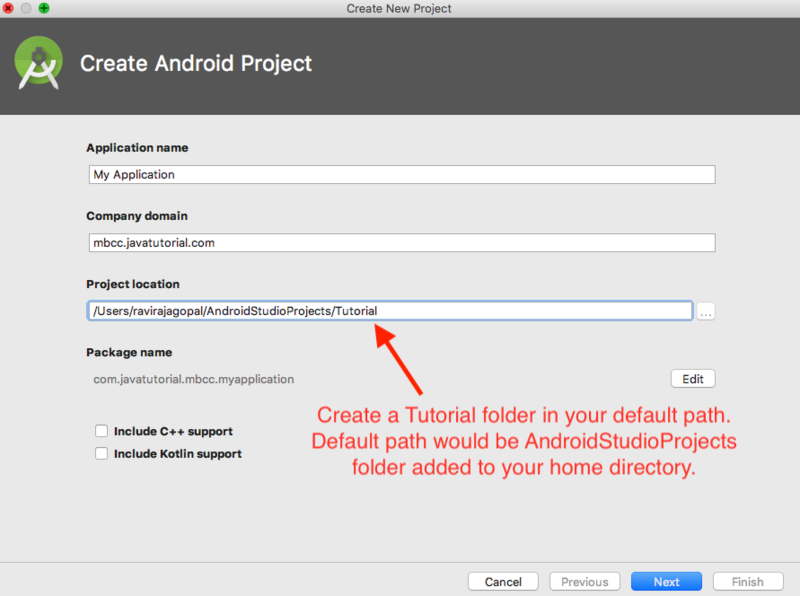 In this step change the default folder ‘MyApplication’ to ‘Tutorial’ and leave the default options for the rest of the selection. On the above screen you will leave the default &apos;Phone and Tablet&apos; checked. 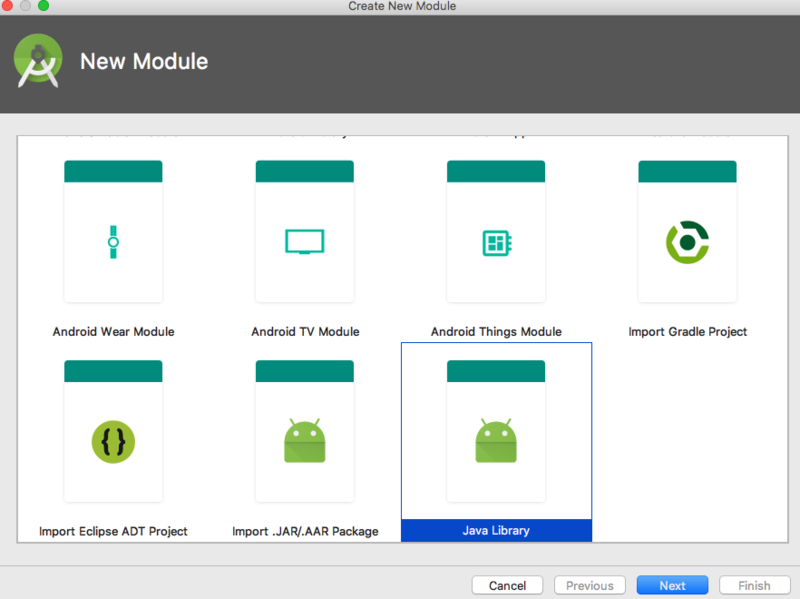 However if you are developing your program for a Android Wearable device or a TV or Car (Auto) or Internet of Things then you would select the other options. You will learn more on the API level in the last chapter. For now you will leave the defaults alone. In the above screen also you will keep the default &apos;Empty Activity&apos; selected. 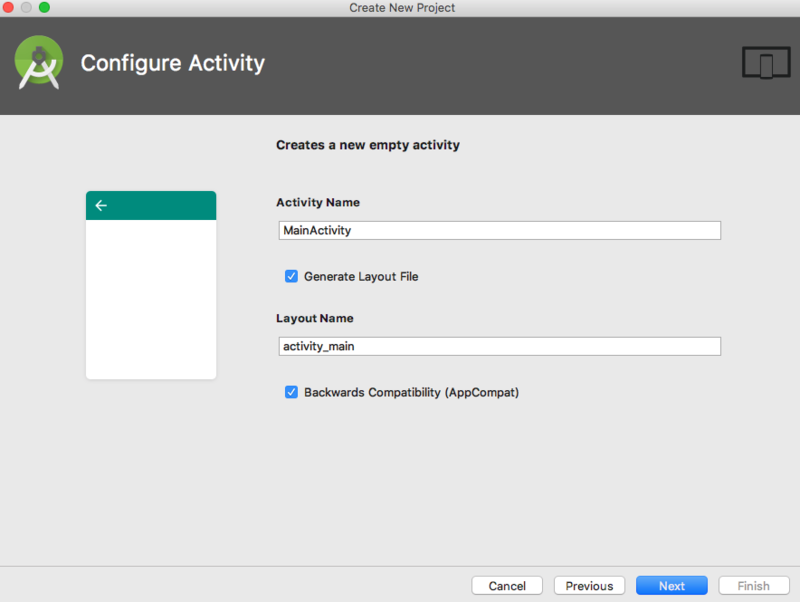 With this default, the IDE creates a basic Activity class and its associated files. You will learn more on Activity in the last chapter. The last step will start downloading the needed components from the Internet and the below screen is shown. 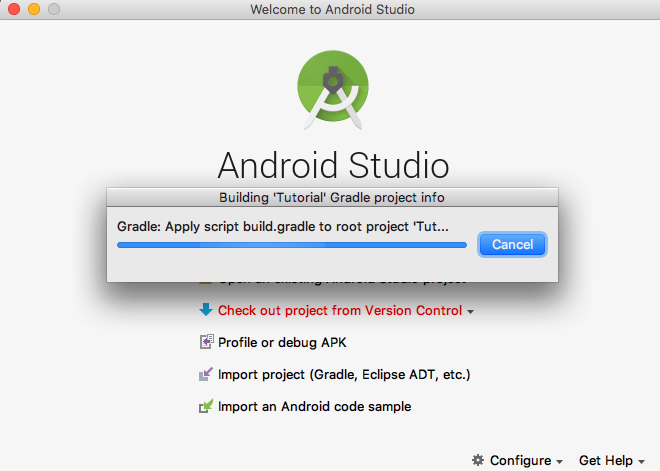 After all components are downloaded, gradle will start building the project and opens up the MainActivity Java class in the editor from the project which was just created. 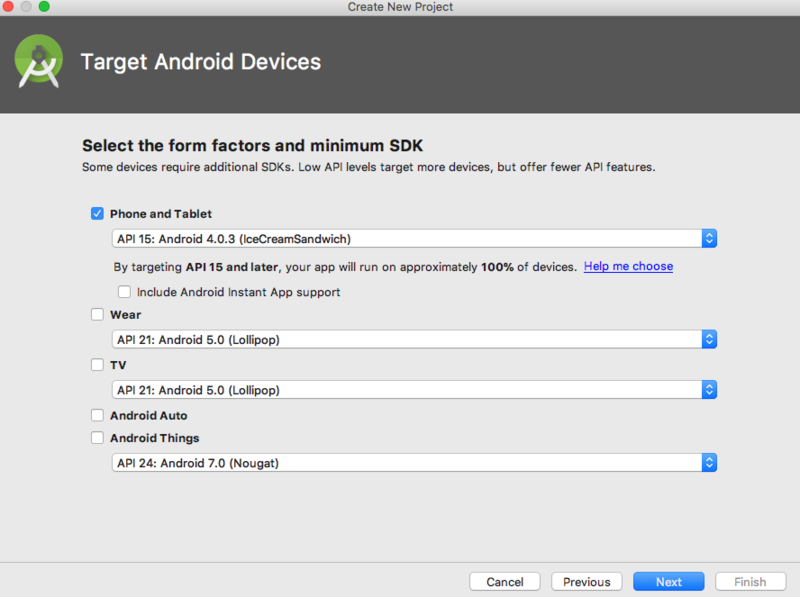 Note in the above step, gradle may show an error due to missing sdk&apos;s. And sdk is an acronym for Software Development Kit. 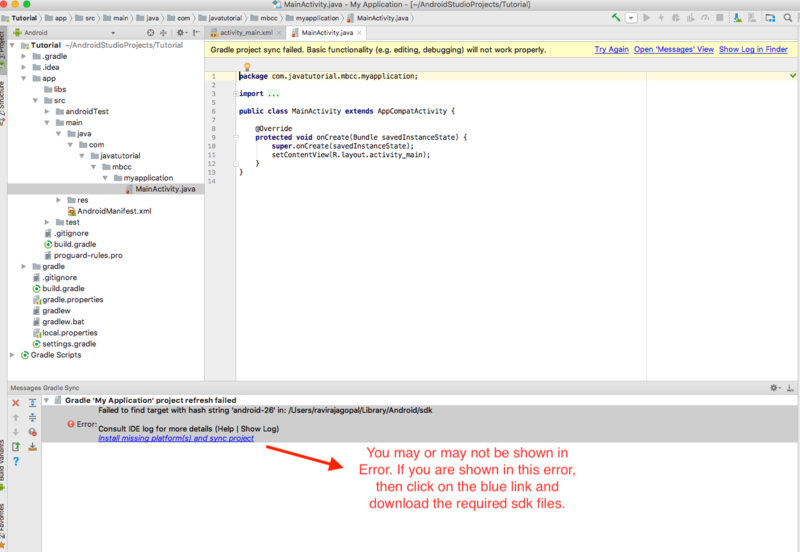 These errors show up because by default Android Studio does not download all the sdk&apos;s and libraries that you might need. 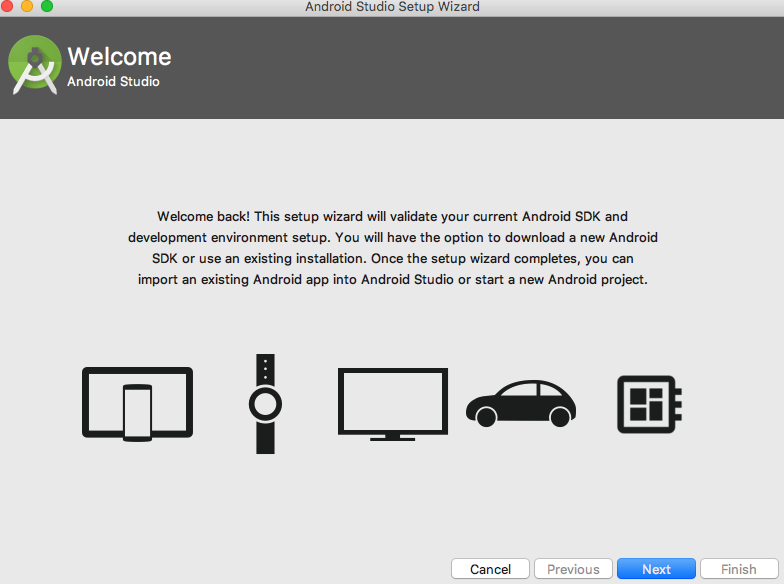 Every version of Android has its own sdk. 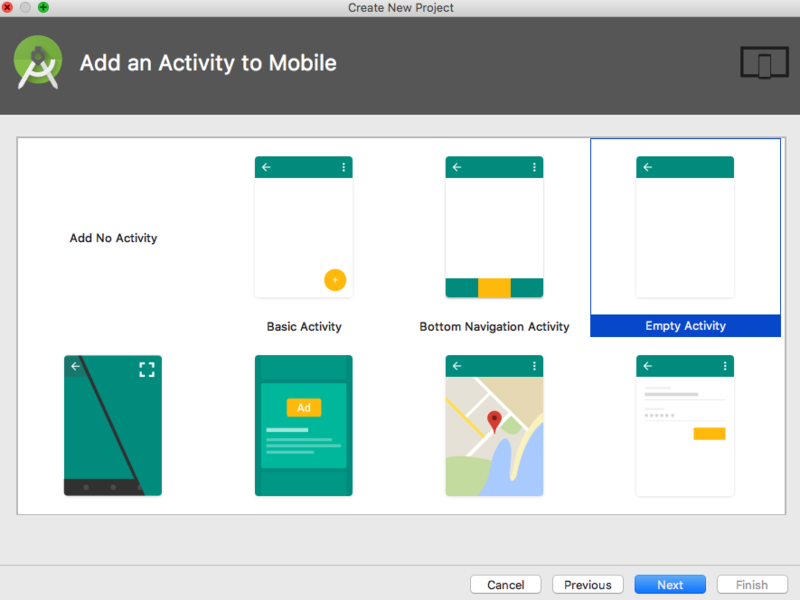 Every emulator that you create has its own set of libraries that you need to download. 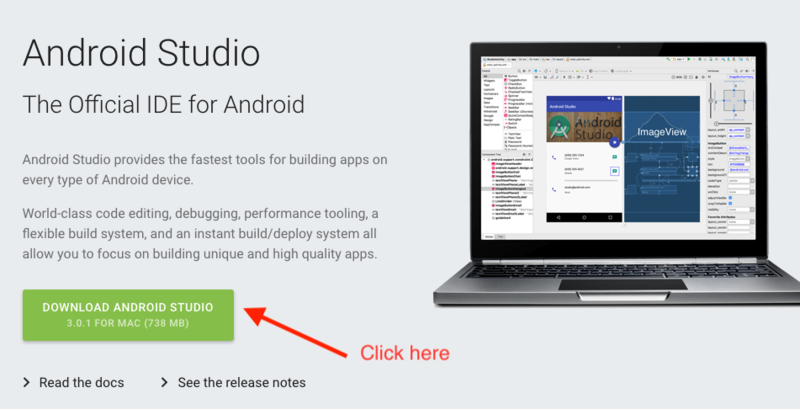 Android Studio typically gives us a link to download the missing software. Click on the blue link which will show the next screen. 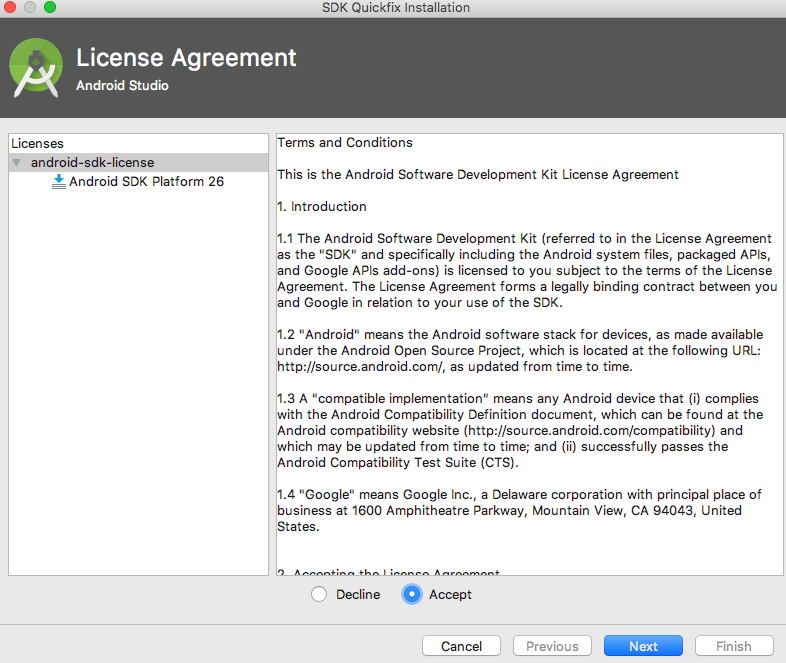 Choose ‘Accept’ for the license and then the downloads of the missing software begins. 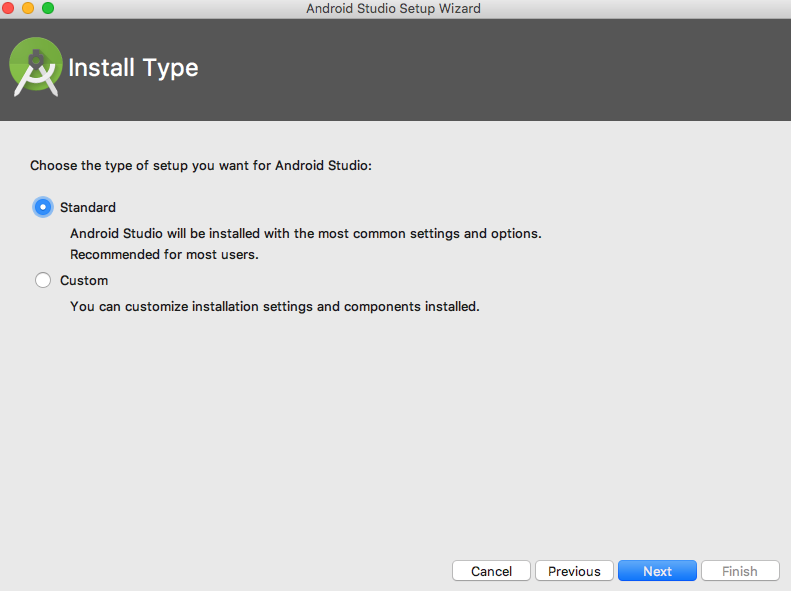 Once you accept, Android studio will download and opens the MainActivity class as shown below. 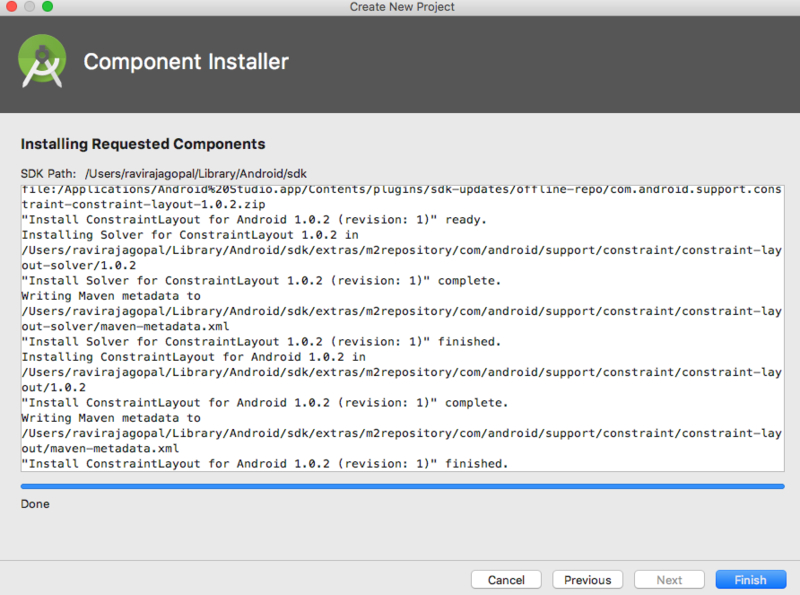 Wait till gradle finishes its build to see if there are any more errors. Now it is time finally to run our Tutorial program!! There are two ways to run this program. 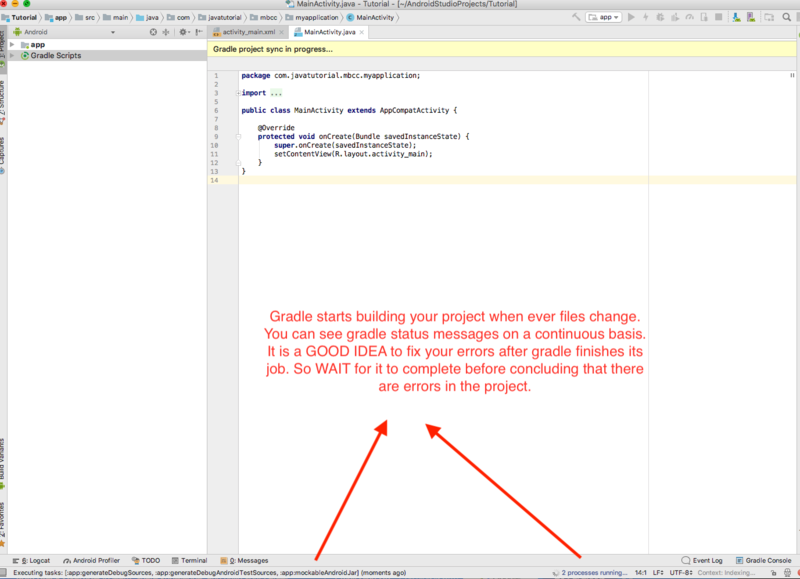 The first time you invoke the program, gradle will take a while to show the output. But when you make changes and run it again, it will take lesser time. 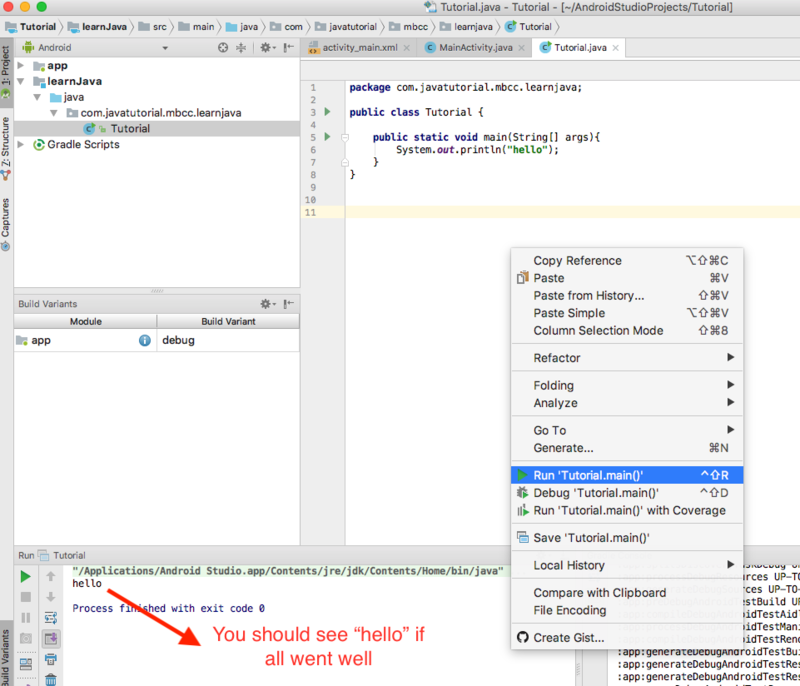 If all went well, you should see the word "hello" in the output as shown in the figure above. Congratulations!! You have come a long way in this setup. 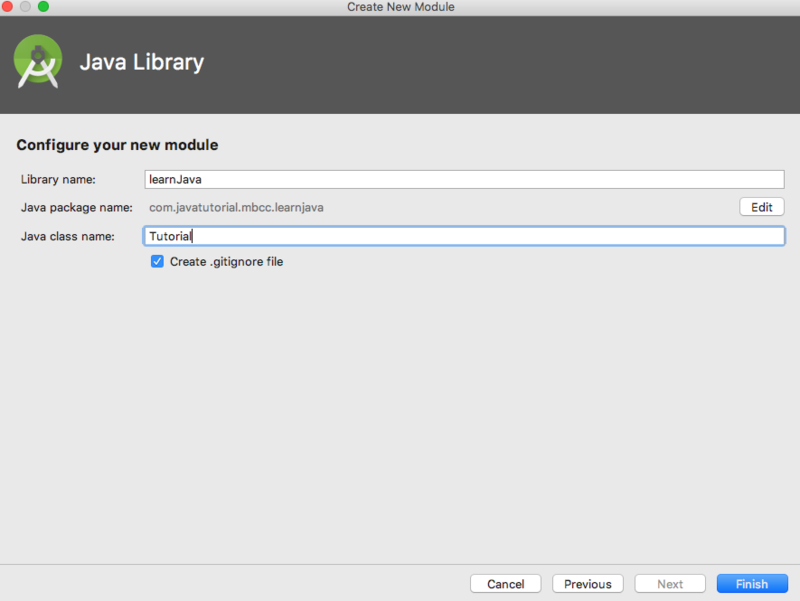 You downloaded Android Studio; setup a Java library module and created a Java class called ‘Tutorial’ and added the main method to print out "hello" on the screen. Are you wondering what all these jargons are? 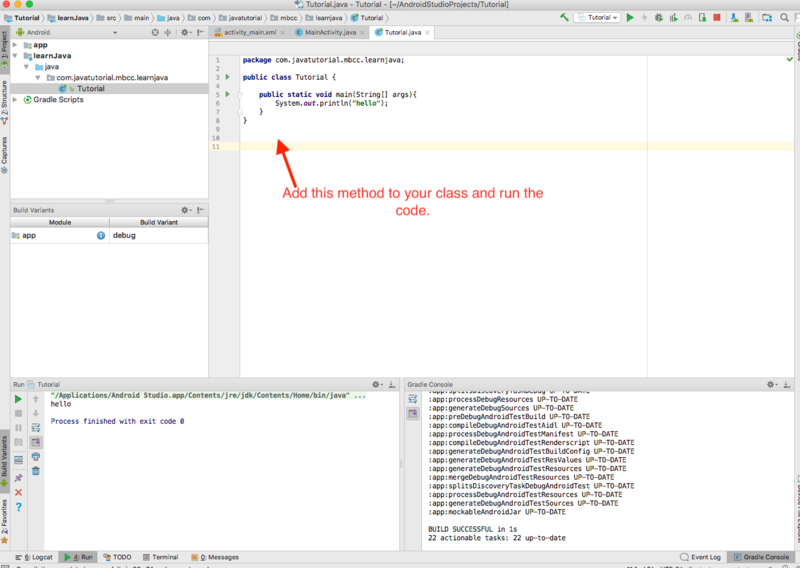 In the next lesson you will learn what is a Java class, what is a method and what are println statements.